God reclines upon His velvet chaise longue and reflects upon a hard week in the office. He forms a mental checklist of tasks completed. Grass and herb yielding seed... And it is so. He freezes and slaps his forehead. Omnipotence clearly does not preclude absent-mindedness. He has forgotten to check that the fruit in Sauternes turns into wine and left bunches dangling on the vines. Unforgivable. He must have been distracted by sculpting those Norwegian fjords. Throwing down the papers, He dons his robes and examines the Sémillon and Sauvignon Blanc. It is a sorry sight. Fog has rolled in from the river and the shriveled berries are rotten. Out of curiosity, He nibbles a berry. Astonishing sweet nectar fills His mouth. It tastes like melted sunshine. Its unctuous texture laps against His senses. What nectar! “I am a genius,” He roars in relief, having created serendipity via Sauternes and Sauternes via serendipity. There is scant documentation with respect to the genesis of Suduiraut. We do know that in 1580, Léonard de Suduiraut married Nicole d’Allard, whose dowry included land in the commune of Preignac, the present site of Suduiraut, adjacent to Château d’Yquem. For reasons unknown, the family raised the hackles of the Duc d’Epernon during the ancien regime, and he duly razed the property. Undeterred, the owner, now Leonard’s grandson, responded by constructing one of the grandest châteaux in the region, resplendent with square and cylindrical witch’s-hat turrets flanking either side and expansive gardens designed by André Le Nôtre, whose horticultural handiwork can be viewed at Versailles. To this day, the château at Suduiraut retains a sense of grandeur and occasion, particularly when approaching via the long driveway that passes endless water features and verdure. An aerial shot of the splendid gardens at Suduiraut, which I have never seen because I am always in the cellars or the tasting room. Now I know. The estate passed into the hands of the du Roy family when Marie-Anne de Suduiraut bequeathed it to her nephew, Joseph du Roy. It is possible, though not verified, that the cru was renamed for a period as “Ancien cru du Roy,” which appears on some older labels. Suduiraut absorbed the neighboring Castelnau (spelled Castelnaud in old editions of Féret), which was owned by Monsieur Pugneau at the turn of the 19th century, to create a 195-hectare estate. 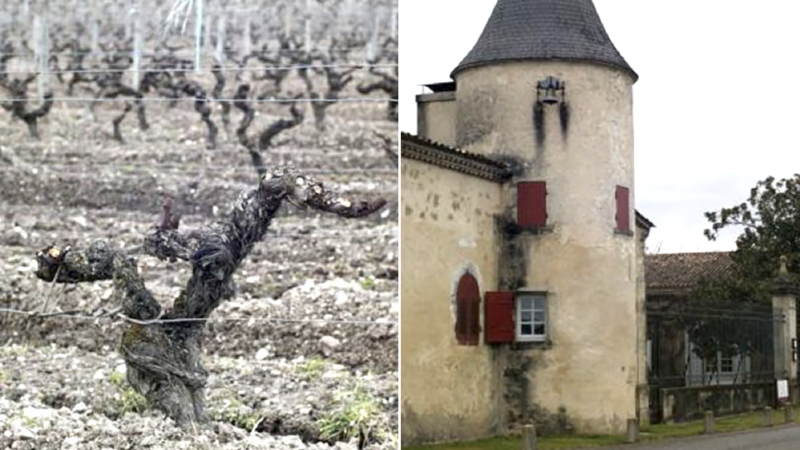 According to the seventh edition of Féret, Castelnaud contained a 15-hectare vineyard planted with red grape varieties and therefore a little re-grafting would have been necessary. The name lives on as the second wine of the estate. 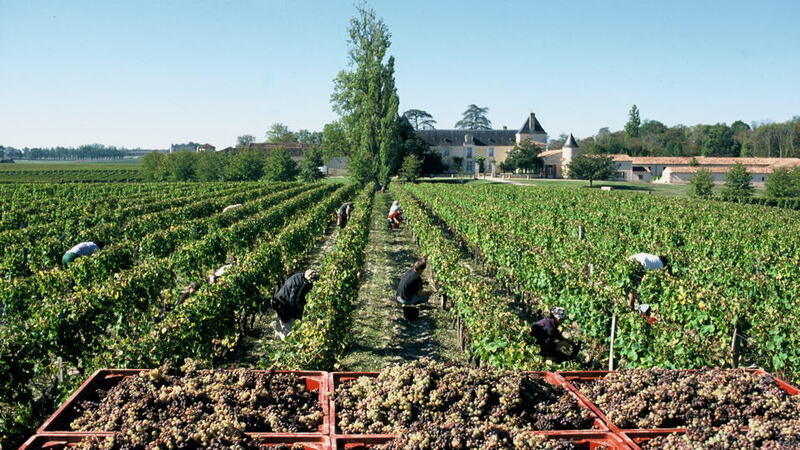 On April 18, 1855, Suduiraut was officially classified as Premier Cru. However, the Roy family was without an heir, which led to its sale to Guillot frères. This coincides with a golden period for Suduiraut, when its wines won numerous awards at the Paris Exhibitions in 1867, 1878, 1879 and 1889. According to the 1868 edition of Féret, there were 70 hectares under vine that yielded between 100 and 120 tonneaux per annum. In 1875, the brothers sold their estate to Monsieur Rabourdin, and in 1893 he bequeathed the estate to his son-in-law, an engineer by the name of Emile Petit de Forest, an acquaintance of fellow engineer M. Eiffel. Petit de Forest set about replanting the vines onto American rootstock to insure against phylloxera. While some properties loathed mentioning the uprooting of vineyards to plant foreign vines, for fear of damaging their reputation among clientele, Suduiraut seemed proud of their proactive approach; perhaps the owner’s engineering background instilled a realistic mindset rather than one of misplaced patriotism. Emile Petit de Forest passed away in 1899. Clive Coates MW suggests that following his death, the estate was neglected and failed to exploit the unprecedented fecund run of growing seasons in the 1920s to the same degree as its contemporaries. Personally, I am not so convinced that was the case. The estate was run by Emile’s widow until her passing in 1929, whereupon it passed into the hands of her daughter Isabelle Petit de Forest and her husband, Alfred de Girondon-Pralon. In 1940, the proprietors sold Suduiraut to an industrialist from northern France, Léopold-François Fonquernie, who remained in charge for over four decades. As for the daily running of the estate during wartime, responsibility devolved to local women and children, who did their best using the depleted equipment at their disposal. Suduiraut entered the doldrums in the 1970s. Woeful growing seasons were only part of their problems; the estate’s owners also ceased to pursue quality as they once did. Stephen Brook, writing in The Complete Bordeaux, accuses the previous management of “endemic chaptalization,” up to two degrees in alcohol. Perhaps this drop in quality stemmed from the death of Fonquernie and the passing of the estate to his daughters, particularly Mme. Madelaine Frouin, who subsequently managed the estate. Maître-de-chai M. Bayéjo was predisposed to age the wine in cement vats for up to three years instead of using more expensive barrels, which were only introduced after his retirement and replacement by Pierre Pascaud. The first vintage that Pascaud took full responsibility for was the 1978. The estate shifted more towards conservative winemaking, though still prioritizing quantity over quality. The wines became more alcoholic, with less residual sugar, compensated by zealous chaptalization. The planting of unsuitable SO4 rootstocks (currently being phased out) illustrates the rather lackadaisical approach. To all intents and purposes, the complexity of Suduiraut’s terroir was too difficult to work, understand and exploit. The 1980s was a mostly forgettable decade for Suduiraut. Bereft of direction and inspiration while its peers were striding forward, the estate procrastinated between quantity and quality. Was the wine sweet or alcoholic? They decided that perhaps matters could be remedied by releasing a special cuvée, though it never became established like Coutet’s Cuvée Madame, which has continued for decades. In fact, only two vintages of Suduiraut’s Crème de Tête were ever released. Left: Managing Director Christian Seely indicated to me during a foray into the vineyard that this parcel was used to make the Crème de Tête. Right: Suduiraut Tower. In 1992, AXA Millésimes added Suduiraut to their portfolio, which in Bordeaux includes Pichon-Baron, Pibran and Petit-Village. They did not have an easy start despite overseeing the releases of 1989 and 1990. Nary a drop of Suduiraut was released in 1991 due to the April frost, and winemaker Daniel Llose once told me that the 1992 crop was discarded due to bad rot. Alain Pascaud joined his father in the same year, but it was another three years before his father retired. Allegedly, they did not always see eye to eye. This hindered progress, and in 1993, again, no wine was released due to the lamentable season. Suduiraut’s new proprietors must have begun ruing their decision to invest in Sauternes. At least the latter half of the 1990s witnessed some production and releases onto the market, even if quality-wise they continued to tread water. I took this photograph of Christian Seely, looking dapper in his trademark bow tie, while touring the vineyard several years ago. I suspect part of the problem was that both Jean-Michel Cazes and Daniel Llose were understandably preoccupied with their rejuvenation of Lynch-Bages and also directing Pichon-Baron. 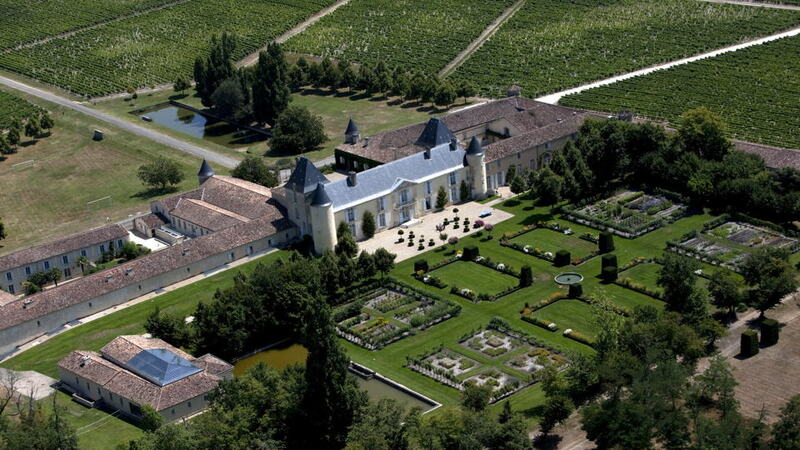 At least those properties were just around the corner in Pauillac, whereas Suduiraut was a two hour drive away. A change in personnel was needed, in terms of both an overall manager of AXA Millésimes’ Bordeaux estates and a skilled, dedicated estate manager to oversee daily operations. In 2001, Christian Seely was appointed to run the entire portfolio, including Suduiraut, and he hired current cellarmaster Caroline Gendry. Pierre Montégut made his debut as technical director three years later. There is no question that post-2001, Suduiraut achieved long-overdue improvement in techniques and quality, proven by several verticals that I have conducted over the years, including this one. So let us examine the reasons for this improvement, both in the vineyard and in the winery. 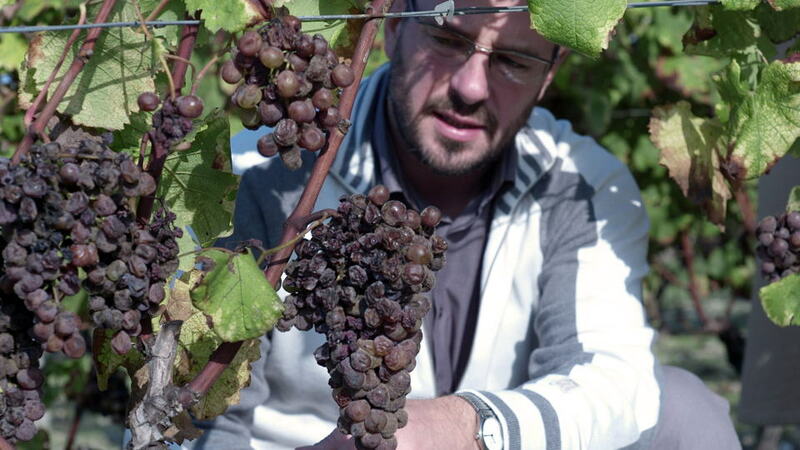 Technical Director Pierre Montégut inspecting the bunches just before harvest. Harvest time at the property. Close-up shot of botrytis-affected berries at Suduiraut. When tasting the 2001 Suduiraut, I noticed that the residual sugar level is 150g/L, almost twice as much as vintages during the previous two decades. Successive releases have all varied around that level (see individual tasting notes.) Part of the reason is a succession of more benevolent growing seasons, but Montégut offered a more technical explanation. “The level of residual sugars has increased for several reasons. Firstly, better viticulture and the mastering of lower yields and therefore better maturity before botrytis formation, so that we harvest at the same stage of botrytis evolution but at a higher level of concentration. For example, the 1967 was picked at 19.5% potential alcohol and the 2007 at 21.5% potential alcohol, both late vintages. They reached the same level of alcohol but the difference of two degrees potential resulted in an additional 36gm/L extra residual sugar. The balance has changed. Today we stay between 13.5% and 14.0% whatever the initial richness.” He went on to stress that the goal is not to create a sweeter wine, since that does not implicitly make a superior Sauternes, but rather to respect an approach geared toward picking berries at the optimal stage of botrytis without excess. Apart from the Grand Vin, the estate produces a Sémillon-based dry white, S de Suduiraut, and another blend from an average of 20-year-old vines, Blanc Sec de Suduiraut. A third label entitled Castelnau de Suduiraut comes from lots that tend to express themselves earlier than others. The tasting held at Château Suduiraut with Seely and Montégut in March 2018 covered vintages from 1958. I expand these with venerable bottles of Suduiraut that were tasted separately. They are incredibly rare and therefore I will not dwell on them individually but provide a general overview. Left and middle: Two ancient bottles of Suduiraut. Note that the label states “Ancien Cru de Roy.” Right: Amongst the greatest vintages of Suduiraut is the brilliant 1929. The oldest vintage that I have tasted is the 1899 Suduiraut from half- and full-size bottles, the year that proprietor Emile Petit la Forest passed away. Both are magnificent, brushing aside a century-plus of evolution and continuing to offer vinous pleasure. I speculate whether this and the impressive 1900 Suduiraut would have come from grafted vines. My feeling is that they do, though the 1899 boasts more profundity. 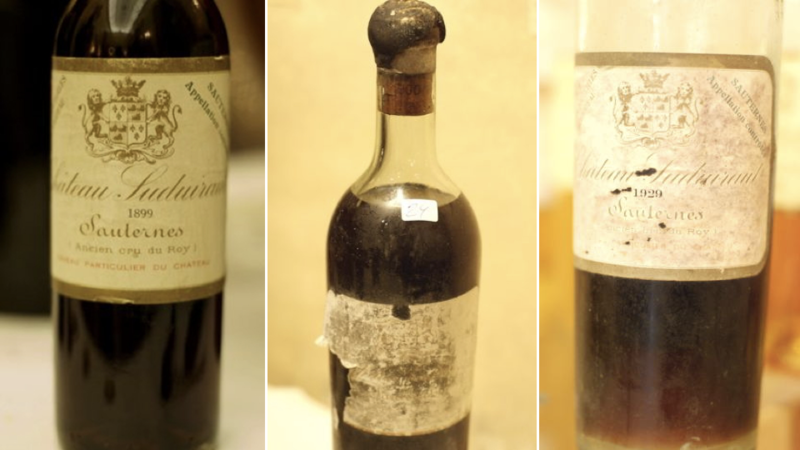 The 1923 Suduiraut does not support the theory that under the tenure of Petit la Forest’s widow, the property failed to capitalize on that decade’s run of great vintages, not least because the 1928 Suduiraut, entered onto the Vinous database last year, and the 1929 Suduiraut are in extremely fine fettle. In particular, the 1929 is a benchmark Sauternes that galvanizes my view that it constitutes the century’s greatest Sauternes vintage. None of the Suduirauts from the 1930s is of note except the 1937 Suduiraut, while the 1940s failed to deliver what you might term a “stellar” Suduiraut in 1945, 1947 or 1949. 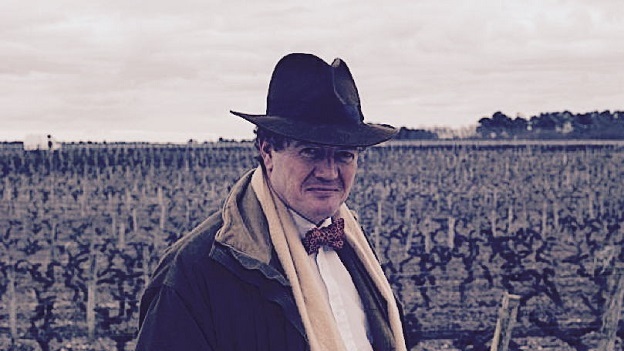 New owner Léopold-François Fonquernie oversaw merely very good wines that, frankly, never achieved the same heights of coeval d’Yquem, de Fargues and Climens. Was Suduiraut coasting during this period? Quite possibly, though the 1955 Suduiraut serves as a reminder that they could still produce wines worth talking about. There was no vintage over at Yquem, but they eked out 20 barrels of the 1964 Suduiraut,which has 79gm/L residual sugar. This bottle did not convey the same algae-like scent on the nose as a previous one that I tasted. There is freshness if not precision on the palate; this is a decent if not memorable wine from a very challenging Sauternes vintage. The 1965 Suduiraut was born in an annus horribilis. Everything went wrong weather-wise, and even that most consistent Bordeaux estate, La Mission Haut-Brion, could not muster a drinkable wine. However, the 1965 Suduiraut is not just drinkable, but enjoyable, an opinion shared by David Peppercorn MW, who wrote in his Bordeaux book: “The 1965 was a charming off-vintage, light and fine.” The 1966 Suduiraut was created mostly from the first trie through the vineyard. David Peppercorn witnessed its birth and wrote: “I remember visiting the château during the gathering of the 1966 vintage. There had been some rain the previous day, which had caused must readings to fall to 15 degrees (potential alcohol), whereas before they had been obtaining 20 degrees. Mon. Fonquernie had immediately given instructions for picking to stop until conditions improved. At Yquem, which I visited on the same day, exactly the same thing occurred, but the picking continued.” Displaying hints of chlorine on the nose, a trait I often discern on mature Sauternes, this is a good Suduiraut with pleasing depth, even though it never kicks on toward the finish. The 1967 Suduiraut contains less residual sugar than the 1966, at 70gm/L, which is low given the precocity of the vintage, and explained partly by the higher alcohol level, at 14.8%. 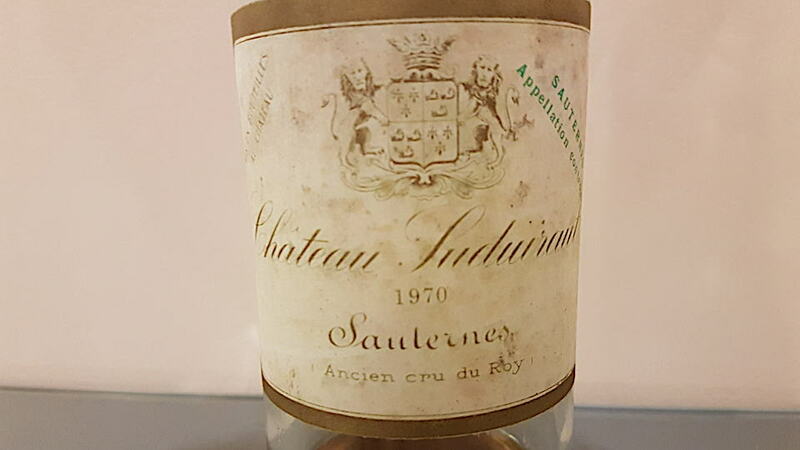 It is an impressive, almost Barsac-like Suduiraut, one that benefits from aeration, not the best you will find in this famous year for Sauternes but the best of the decade that finishes with the 1969 Suduiraut, and better than you might think. It was not until I examined this bottle of 1970 that I noticed that the inscription “Ancien Cru du Roy” remained on the label. The 1970 Suduiraut reminded me of a light German Beerenauslese and patently lacked some botrytis, but was pretty in its own facile way. The palate was well balanced but ineluctably simple, offering orange peel and marmalade, and leading to an almost Barsac-like but ephemeral finish. The 1971 Suduiraut contains just 64gm/L residual sugar - low for a great Sauternes. I previously thought it superior to the 1970, although the second bottle puts it neck and neck when, given form, the 1971 ought to be ahead. Compared to, say, the fantastic 1971 Coutet, Suduiraut falls short. Montégut speculated that just the first picking comprises the 1972 Suduiraut, which has the lowest recorded residual sugar level at 50gm/L. It’s no disgrace, but it’s not as good as, for instance, the 1972 Climens. The 1975 Suduiraut is the finest wine from that decade, and its no coincidence that that was the year that Pierre Pascaud joined the team. Aged for 12 months in barrel, it is clearly ripe and more generous than the succeeding vintage, evidencing more botrytis and harmony toward the finish. This is well worth seeking out. The 1976 Suduiraut is deep amber in color, the nose Barsac-inspired, and rather old-school, though the finish retains decent freshness. It just lacks the complexity and depth of the superior 1975. Neither the 1978 nor the 1979 Suduiraut has aged gracefully. The former was blended with 15% Sauvignon Blanc, like all successive vintages up until the 1990. Château records show that it was a very late harvest, not completed until November. Unclean on the nose, simple on the palate, this is one I’d steer clear of, just as I would the 1979, which indicates excessive use of chaptalization and sulphur. The 1981 Suduiraut is commendable at 30 years of age. It was a cool growing season, and though the harvest was late, there appears to be a commendable level of botrytis. However, it will not set your world on fire. In 1982 the Sauternais sufficed with a mediocre vintage bereft of the damp conditions to provoke noble rot. Consequently, most Sauternes are ordinary, but there are two that bucked the trend, predictably Yquem and less predictably Suduiraut. The 1982 Suduiraut, aged in 25% new oak and 25% one-year-old barrel (the rest presumably in tank), has a vivacious bouquet, while the palate is simple but harmonious. What it lacks in botrytis is compensated with vigor and purity. It is interesting to compare the Crème de Tête against the regular bottling. For a start, the 1982 Suduiraut Crème de Tête contains 128gm/L residual sugar instead of 95gm/L; the wine was raised for 24 months instead of 18 months, in 100% new oak; and the alcohol level is higher, at 14.3%. The aromatics are not as complex as those of the 1989, and overall the wine seems bereft of a sense of occasion, with a doughty Tokaji-like finish. Given the choice, I would seek out the regular cuvée. Thereafter, Suduiraut’s wines went off the boil. A bottle of 1983 Suduiraut is an abject disappointment in the context of a great Sauternes vintage. The nose is lifeless and the palate denuded of tension and vivacity, especially on the finish, which whimpers away like a scolded puppy. The analysis indicates nothing went awry, but the technical sheet states “grosse récolte,” from which one infers excessive yields. The 1984 Suduiraut is only marginally poorer. At 65gm/L, it has the lowest residual sugar level between 1975 and the present, and it just feels emaciated. Gray rot is palpable on the risible 1985 Suduiraut, picked between September 14 and November 18 with beaucoup passerillage, according to the records. It attests to a continued lack of selection in the vineyard. More inexcusable than the 1985 is the sheer blandness of the 1986 Suduiraut, from a benevolent growing season when reputations were made or lost. This bouquet would not know the meaning of botrytis if you tattooed the word across its forehead. Nul points for effort. Suduiraut fumbled a classic Sauternes vintage like a wicketkeeper with two left hands. The world was spared a 1987. The 1988 Suduiraut offers hope that they did not waste the triumvirate of vintages that ended the decade. Picked over eight tries through the vineyard, cropped at 17.7hl/ha and at 14.8% the highest alcohol level since 1967, this is light in color with a simple nose. The palate is pleasant but provides scant evidence of the botrytis that was available that year. Not a bad Sauternes by any means, and certainly better than the 1986, yet bottles should be opened sooner rather than later. The 1989 Suduiraut sees the estate getting back on track. Representing 80% of the harvest, cropped at 23.4hl/ha and matured in 30% new oak, it has an attractive bouquet and a fine viscous texture. Unlike the 1982, I aver that the creation of the 1989 Suduiraut Crème de Tête is at the expense of the regular bottling. Maybe if they had produced one cuvée, they could have returned to form. Representing 10% of the total crop, it delivers a head-spinning 141gm/L residual sugar and was raised for 24 months entirely in new oak. The nose is captivating, not a million miles away from a Tokaji 6 Puttonyos. The palate shows the best balance of any vintage since the 1975, and the finish offers great purity and penetration. Hallelujah! Here is a great Suduiraut – the downside being that its small production denied many Sauternes-lovers the opportunity to taste it themselves. Somewhat surprisingly, the estate elected not to produce a Crème de Tête the following year. Daniel Llose once divulged that the decision not to bottle a 1990 Crème de Tête was made just prior to bottling and that 10% of the regular blend includes this abandoned cuvée. Bill Blatch remembered tasting the 1990 from barrel. He told me that Pascaud blended three prototypes. Blatch felt that the least alcoholic wine was the best; however, Pascaud chose the most alcoholic blend. Perhaps that explains why I have never been a huge fan of the 1990 Suduiraut, nor has Montégut, who feels that it has not aged as well as other vintages. It has more residual sugar than the regular 1989 at 106gm/L and was cropped at 22.7hl/ha. Perturbingly deep in color, it has a decent if unexciting Tokaji-inspired bouquet, the palate is generous, and yet there is a slight oxidative note on the alcoholic finish. After missing three successive vintages, the estate returned with the 1994 Suduiraut. A stricter sorting policy implemented by AXA Millésimes meant that the wine represents just 34% of the crop, and they continued to deselect around 30% to 40% of production until the 2002 vintage. The 1994 was aged for 16 months in 90% new oak, a higher percentage given that they usually used around 30% and only increased to 40% with the 2001 vintage. Perhaps they were trying to buff up an average vintage, desperate for something, anything, to release. It is not a bad wine by any stretch of the imagination but it lacks length and complexity. Over the remaining decade, the new regime ought to have put their stamp on the estate, just as they had done in the rejuvenated Pichon Baron. But the start was what you might call “stuttering.” The 1995 Suduiraut has a rich nose with touches of caramel and spice and a medium-bodied palate offering caramelized pear and dried honey, it but lacks tension and vivacity, especially toward the conservative finish. The 1996 Suduiraut is marginally better, yet it never takes off as later vintages do. The 1997 Suduiraut signifies a move to higher residual sugar level – at 110gm/L, the highest since records began. Given that this was the best Sauternes growing season of the decade, in retrospect it seems a missed opportunity that they produced a good but not great wine. Following a mellifluous but unremarkable 1998 Suduiraut, the 1999 Suduiraut augurs a brighter future, demonstrating greater aromatic purity than the previous two vintages and delivering more vigor on the palate despite its rather terse finish. The millennial vintage was a dismal one for the Sauternais as downpours washed away any hopes of replicating the successes on the Left Bank. But change was in the air as Seely took the tiller of an estate that had been drifting, though the timing of his appointment meant that he was only involved in the assemblage.“The 2000 used only the first picking. The potential was fantastic. Then the rain came from October 10th, after the first trie,” explained Montégut. “All the best fruit went rotten on the vine.” Seely added, “Everybody accepted it with a smile,” although he omitted the word “rueful.” The figures are rather curious. According to the records, only 25% of the crop went into the Grand Vin, which boasts 115gm/L residual sugar - more than 1990. Yields were just 10.2hl/ha, the lowest up to that date and unsurprising given the growing season. The wine was matured entirely in new oak (presumbly, if you’ve ordered your spanking new barrels, you might as well use them). However, there is no disguising the fact that the 2000 Suduiraut is not a great wine, but rather ephemeral and afflicted by vegetal notes from the rot. Just some of the bottles assembled on the window ledge at Suduiraut. The turning point is the 2001 Suduiraut. 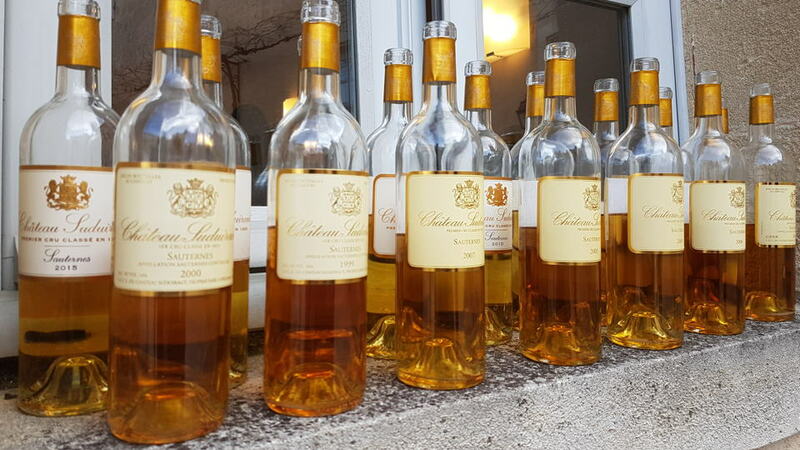 Sauternes reveled in a precocious growing season that compensated for the previous year, and the estate finally addressed the problems of the previous three decades, recognizing that the only approach was quality at any cost. Apparently they did consider releasing a Crème de Tête in this year but decided against it, thereby putting a nail in its coffin. “The Château Suduiraut 2001 was cropped at 15.3hl/ha. We could have made 10,000 cases, but we only made 6,000. The wine has 150gm/L residual sugar, and it was matured in 30% new oak, 30% one year old and the rest two years old, for 24 months,” Seely noted. “You have the same sweetness as 2005,” opined Montégut, tasting the wine again in Sauternes, “but more acidity, mineralité and spiciness.” Now, at 17 years of age, it finally delivers a nose worth getting excited about, delivering gorgeous quince and dried honey aromas and a slightly Barsac-inspired but beautifully balanced and viscous palate. The 2002 Suduiraut has been overlooked. Cropped at 15.2hl/ha, raised in 35% new oak and 35% one year old, this vintage saw a more severe approach to selection, with just 52% deemed suitable for the Grand Vin. Montégut appreciates the balance of the 2002 and feels that there were fewer rôti notes. I find it still commendable, but perhaps time is beginning to tell and it was never destined for long-term ageing like the 2001. Two thousand and three witnessed the infamous summer heat that begat decadent Sauternes with high sugar levels. “The 2003 Suduiraut was picked with just one trie and the entire harvest was done in two weeks,” Seely told me. “The wine was matured in 40% new oak for 14 months. The final wine had 136gm/L residual sugar and 4.02gm/L total acidity. It has an unusual equilibrium for Suduiraut, but it is surprisingly fresh.” Montégut is not quite so convinced. “There was a sudden ripeness, so there is not the same complexity. There is a passerillage or Tokaji flavor on the finish.” Now at 15 years of age, the 2003 can hold its head high, given the growing season. It has retained sufficient freshness, although it is quite bold and now feels a little short. Alain Pascaud passed away in 2004, and his successor, current winemaker Pierre Montégut, faced a challenging harvest. 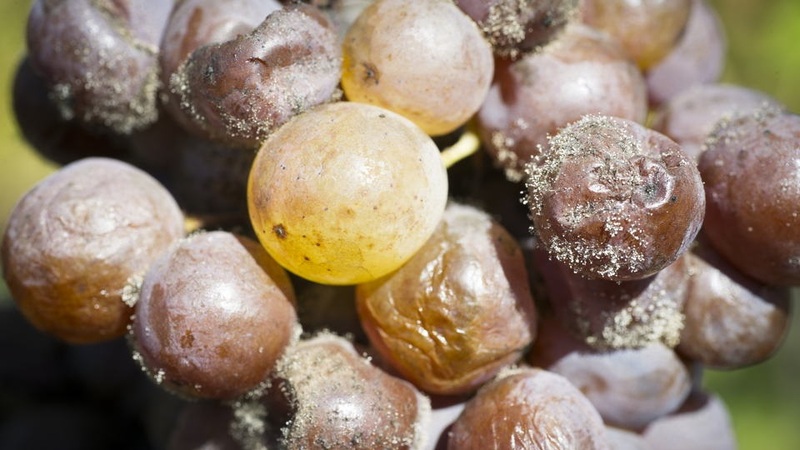 “It was a nightmare because there was some beautiful botrytis, but ugly rot that looked like the noble rot. One grape was fine and the next would taste like soggy cardboard, so you had to be very attentive and pick berry-by-berry. We had to eliminate a lot of the crop, and in the end, 75% of bunches were left on the ground. Consequently, the yield was only 5hl/ha, equivalent to just 2,000 cases.” The 2004 Suduiraut sees a tweaking of the blend. Since 1994, it had consisted of 90% Sémillon and 10% Sauvignon Blanc, but from 2004 the Sauvignon Blanc was reduced to around 5%. Draconian selection, whittling the Grand Vin down to half the total crop, meant that a richer wine was produced, thanks to its 134gm/L residual sugar. Matured in 50% new oak and 50% one-year-old barrels for 16 months, it has matured well in bottle, although I feel that it is now surpassed by many subsequent vintages. “The 2005 vintage was cropped at 19hl/ha and delivered 163gm/L of residual sugar, the highest ever recorded at the estate,” Seely told me. It comprises 97% Sémillon and just 3% Sauvignon Blanc, raised in the highest percentage of new oak to date for a regular bottling, at 65% new and the remainder one-year-old barrels. That extraordinary residual sugar level is partly explained by SO2 addition at 13.08% alcohol, the lowest on record, with low acidity at 3.58gm/L. I was once more enthusiastic about the 2005, but at 13 years of age, though still very attractive in its own right, it pales beside subsequent vintages. The 2006 Suduiraut was cropped at just 10hl/ha and represents 48% of the crop. I have a lot of time for this vintage, which is as good as the 2005 in many ways and certainly one of the more mineral-driven offerings over the last 15 years. You can still pick up bottles at reasonable prices, and it comes recommended. We then move to the 2007 Suduiraut. “It was picked from September 15 until October 30, during which time there were five tries through the vineyard,” recalled Seely. “The first two offered grapes that were passerillé. There was some rain at the beginning of October, and then botrytis set in. The third pass through the vineyard was magnificent and we ended up with 131gm/L residual sugar.” Now we start getting serious – and about bloody time, too. A beguilingly complex and refined bouquet wafts from the glass; the palate is striking in terms of balance, but has enough gas in its tank to recommend long-term maturation. 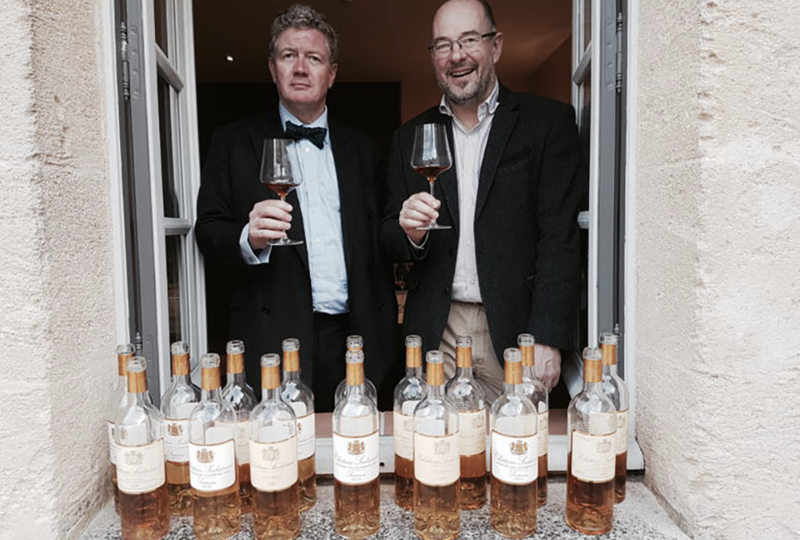 Seely once opined that the 2005 and 2007 represent the style of Sauternes and the style of Suduiraut, respectively. That is a crucial statement, because hereafter the wines finally find their way after many years of wandering in the wilderness. The 2008 Suduiraut is a lovely mid-term wine that shows fine mineral tension and plenty of energy, but the 2009 Suduiraut marks the return of an estate firing on all cylinders. This one is up on the marble mantelpiece with 1929 and 1959. Approaching its 10th birthday, it delivers everything you want from Sauternes, with the stamp of Suduiraut. Looking at the different eras, it seems as if post-2009, Suduiraut steps up a gear. There is a higher mean, irrespective of the vagaries of the growing seasons. Given its history and terroir, I expect Suduiraut to be within the top three Sauternes each year, challenging the supremacy of d’Yquem. The 2010 Suduiraut is simply brilliant; likewise both the 2014 and 2015 Suduiraut. And when the weather doesn’t cooperate, such as in 2012, then instead of releasing a substandard wine, as Suduiraut might have been tempted to do in the past, the estate now wisely opts to release no Grand Vin and safeguard its hard-won reputation. It took a long time, but Suduiraut is back where it ought to be. Christian Seely and Pierre Montégut following the vertical tasting. There have undeniably been periods when Suduiraut lost its way and subpar wines blemished its reputation. From the 1970s until the 2001 vintage, corners were cut at the expense of quality, compounded by a loss of direction and identity. AXA Millésimes’s acquisition put the estate back on track, although it took a few years to turn the corner, and I aver that only since 2009 has Suduiraut operated at a right level. Stylistically, as I have observed before, Suduiraut should be bold and intense rather than elegant, delivering a sense of richness allied with freshness. I like my Suduiraut to make a statement, and often I find a subtle aszú-like character that lends another dimension and enhances personality. You may wonder about the title of this piece, since if you leaf through Genesis, you will not find God creating Sauternes in his first week on the job. In fact, it was Charles Walter Berry who penned the following sentence in In Search of Wine (1934), using the exact capitals and exclamation marks as written: “I instinctively remembered some wines – “Tête” wines of Château Suduiraut, 1899 and 1900 – WHAT NECTAR! !” Indeed, what nectar. Photos of Château Suduiraut courtesy of AXA Millésimes. Used with permission.